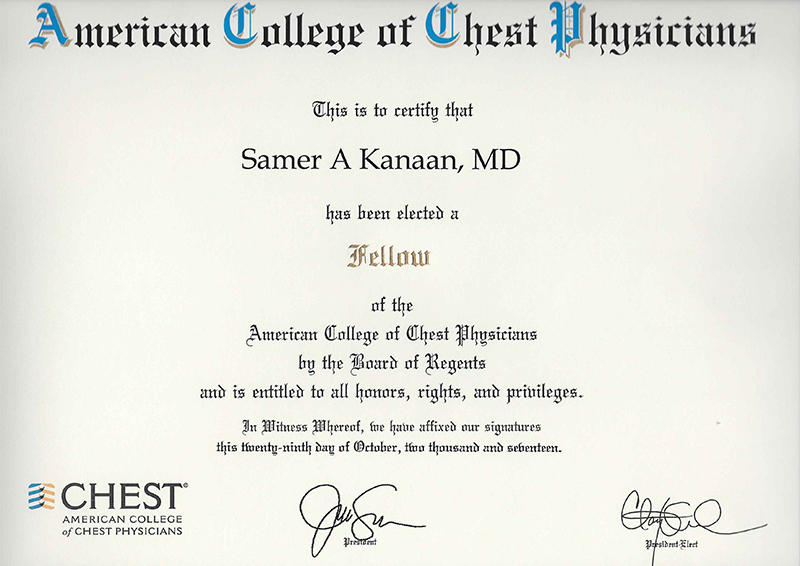 Samer A Kanaan, MD has been elected a fellow of the American College of Chest Physicians by the Board of Regents and is entitled to all honors, rights and privileges. As of January 2018, Dr. Samer A. Kanaan has been appointed as Chair of Cancer Committee at Mission Hospital in Mission Viejo. 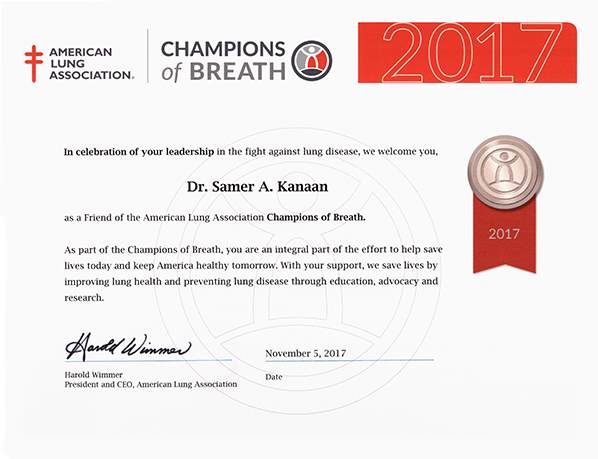 I am proud and honored to be recognized by the American Lung Association’s Campions of Breath for my vision and commitment to advancing the mission to save lives by improving lung health and preventing lung disease. 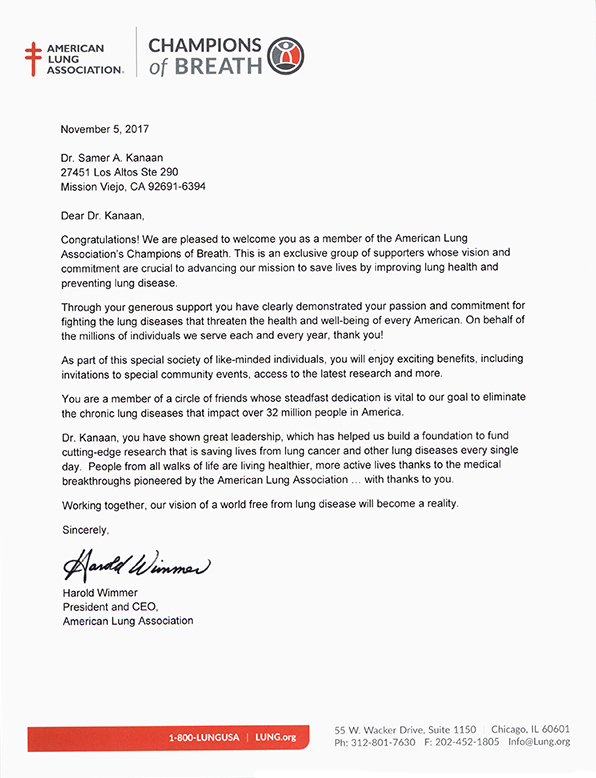 SAN JUAN CAPISTRANO, CA, September 28, 2017, Marquis Who’s Who, the world’s premier publisher of biographical profiles, is proud to name Samer Azzam Kanaan, MD, a Lifetime Achiever. An accomplished listee, Dr. Kanaan celebrates many years’ experience in his professional network, and has been noted for achievements, leadership qualities, and the credentials and successes he has accrued in his field. As in all Marquis Who’s Who biographical volumes, individuals profiled are selected on the basis of current reference value. Factors such as position, noteworthy accomplishments, visibility, and prominence in a field are all taken into account during the selection process. 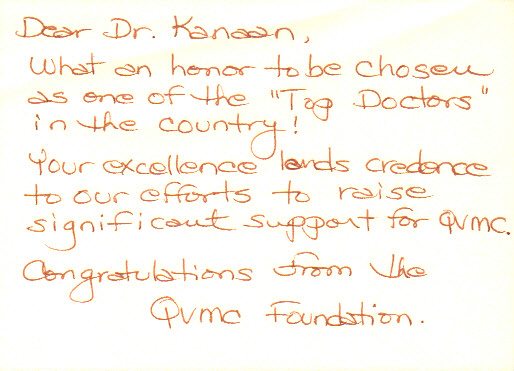 Dr. Kanaan was recently accepted into the MemorialCare Physician Society. 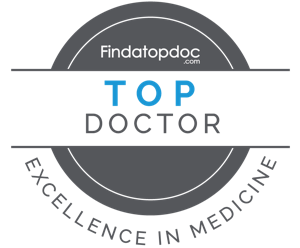 This society is composed of like-minded physician leaders dedicated to the highest clinical care standards. Lung cancer kills almost 160,000 Americans a year, and is the leading cause of cancer death for both men and women. In fact, more people die of Lung cancer than of Colon, Breast, and Prostate cancers COMBINED! The majority of patients with lung cancer present with advanced disease, but recent studies have shown a significant survival benefit with CT scan screening for former smokers. 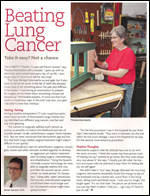 Lung cancer screening should lead to earlier detection and thus earlier stage lung cancers. Surgery is the treatment of choice for early lung cancer and offers the best chance for cure from lung cancer. 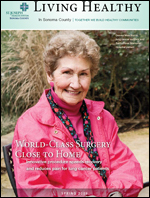 Lobectomy is the removal of a lobe of the lung, usually done to treat lung cancer. Traditionally, a thoracotomy was used to accomplish this, but the incision was large, and painful since this involved cutting or removing the ribs to access the thoracic cavity to perform surgery. Patients would require substantial recovery time both in and out of the hospital, and the traditional thoracotomy approach led to many postsurgical complications. Dr. Samer A. Kanaan is a Board Certified Thoracic Surgeon specializing in Minimally Invasive Thoracic Surgery and Thoracic Oncology. Dr. Samer Kanaan discusses new lung cancer treatment options. 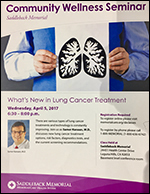 Join Dr. Kanaan on April 5th to learn more. Dr. Kanaan appointed as Cancer Liaison Physician (CLP) at Mission Hospital Regional Medical Center. Samer Kanaan, MD FACS is pleased to announce his recent appointment as Cancer Liaison Physician (CLP) at Mission Hospital Regional Medical Center. Effective January 1, 2017, the tenure of this appointment is for three years. Now Dr. Kanaan is part of an exclusive network of 1,500 physician volunteers charged with the task of providing leadership and improving the quality of cancer care at your facility. The role of the CLP according to the accreditation standard (4.3), CLPs are responsible for activities in five areas: (1) monitoring and interpreting cancer program’s performance using National Cancer Data Base (NCDB) data to evaluate and improve the quality of care the facility provides, (2) reporting on CoC activities, initiatives and priorities to the cancer committee, (3) serving as liaison for the cancer program with the American Cancer Society, (4) being present during the CoC survey and meeting with the surveyor, and (5) completing an online report of annual activities as the CLP. Date & Time : Thursday, May 11th, 1 p.m.
Come learn how Mission Hospital is taking surgery beyond the limits of the human hand! Join Samer Kanaan, MD, Thoracic Surgeon from Mission Hospital in a discussion on how robotic advancements are improving the quality of care, reducing pain and recovery time for patients undergoing a variety of thoracic surgeries such as, cancer, and hernia repairs. Samer Kanaan, MD FACS received a three-year appointment as Cancer Liaison Physician for the cancer program at Mission Hospital Regional Medical Center. Cancer Liaison Physicians are an integral part of cancer programs accredited by the American College of Surgeons Commission on Cancer. Dr. Samer Kanaan and Dr. Jason Ladwig explain a new approach for lung cancer using Electromagentic Navigational Bronchoscopy (ENP) on WWMT's "Doc Talk." Achalasia is definitely not a common household word. But when Janice Howard heard it described to her, light bulbs went off in her head. "I had been suffering with terrible stomachaches and what seemed like acid reflux for years," Janice says. 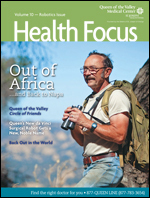 "I went to all kinds of doctors and no one seemed to be able to figure out what was causing it. My husband, James, was incredibly supportive, but over time it got steadily worse and worse and worse." "I'm a Pretty Tough, 72 year-old French Woman," says Theresa Morrissette with a chuckle. "I grew up with no electricty and worked hard every day of my life. I start to go crazy if i have to sit still for very long."